I was talking to a good friend yesterday who recently moved back to Phoenix after being away in California for forty years. And while he's always been sentimental about Phoenix, there's no escaping the truth - summers are awful. For me, of course, it's always been comfortable. I moved to Phoenix as an adult, and once I understood the importance of air conditioning, I was fine. I have a super-dooper air conditioner on my house, and I look back fondly on the super-dooper power of a particularly fine General Motors product that I owned from 2007 to 2017, whose A/C was so powerful that it would cool off the car just about instantly, even when it had been sitting outside. Yes, I like technology. 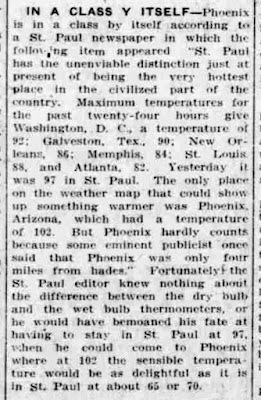 But of course being interested in history makes me think about the people who lived in Phoenix before the invention of air conditioning. And it's really a fairly recent invention, considering that the city of Phoenix has been there since 1870, and there were people living in the Salt River Valley hundreds of years before that. By the way, the kind of true air conditioning as we know it today (technically called "refrigeration"), although its invention goes way back, really wasn't in common use in Phoenix until the 1970s. I had a neighbor in 1978 who bought a brand new car that didn't come with air conditioning. Unthinkable today! It's like any type of technology, once it's everywhere, we tend to think that it's always been there, like cell phones, or the internet. But it wasn't. My first thoughts go to the Hohokam people, who built those huge canals in the Phoenix area, and were gone long before the Phoenix pioneers even started thinking that the Salt River Valley would be a good place to build a city. Not only did the Hohkams not have air conditioning, they didn't even have electric fans. Of course no one really knows much about these people, other than the fact that they lived in the Phoenix area, but it had to be miserable when it got hot. My best guess on this is that those who could get out of the valley for the summer did. It must have been quite a walk up to the cooler areas of Arizona, but it certainly would have been worth it. And that leads me to something that I've discovered is a very common misunderstanding about old-time Phoenix, that people stayed in town in the summer - they didn't. Anyone who could get out, did get out. The people left behind I call "desert rats" and they just toughed it out, wishing that they were in the mountains, or in California on the beach. Phoenix would have been mostly empty during the summer. I picture tumbleweeds rolling by, and a couple of desert rats sharing a bottle of whiskey, but not much more than that. Of course most people who live in Phoenix can't imagine all of this, and the most common comment that I see that shows this is when people comment on the clothing of people in photos of old Phoenix. The comments inventively say "those clothes look hot! ", as if these people were in Phoenix in June, or July. They weren't. Those old photos with people all dressed up, with men in suits and women in big dresses, are from the winter, when it's actually comfortable to dress like that. So getting out of the valley is the number one thing people did before the invention of air conditioning, and it's still a popular thing to do. As I write this I think that it would be nice if I had a place up in the mountains, or on the beach, but I don't. But at least I have air conditioning. Thank you for living through the summer in Phoenix with me! 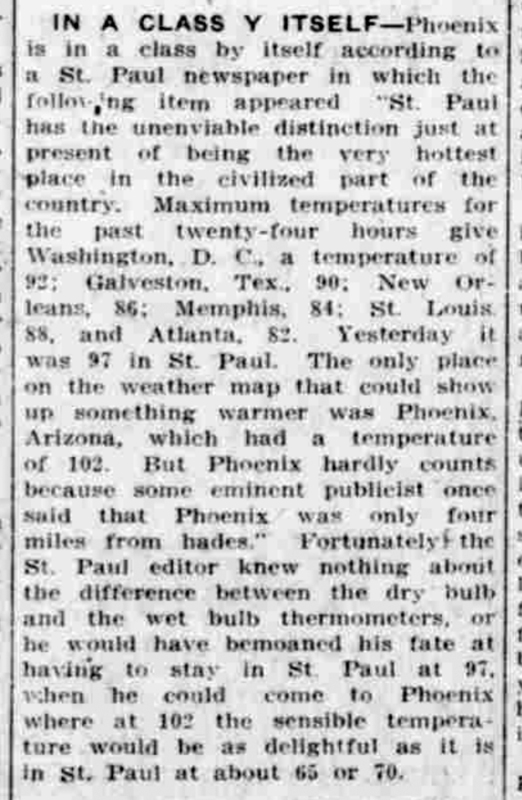 Image at the top of this post: 1910 newspaper article about the weather in Phoenix, described as "four miles from Hades".